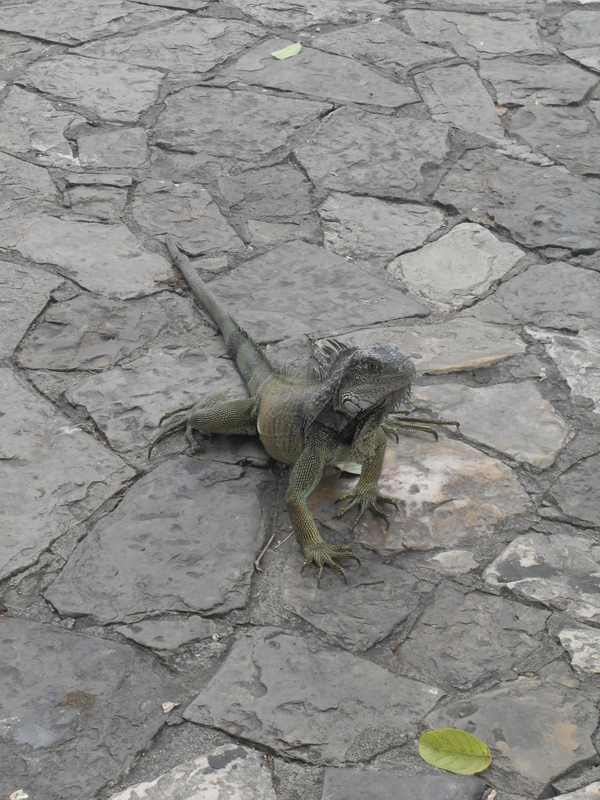 Ecuador in my eyes | A glimpse into one student's study abroad journey. 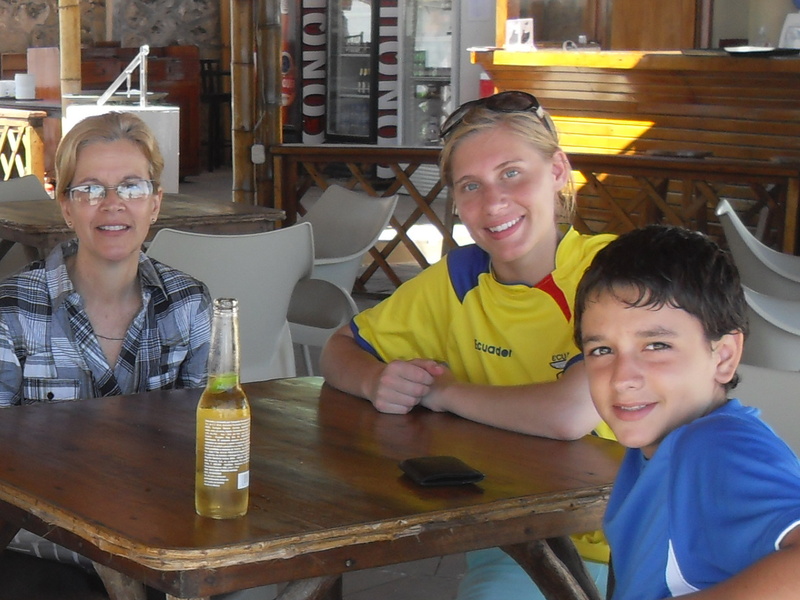 The last two weeks I have passed the time with my lovely and welcoming Ecuadorian relatives. It has been a dream since my childhood to know the places, people and culture that my grandfather was born into and left over fifty years ago to come to the U.S., so this was an especially meaningful part of my trip to Ecuador. 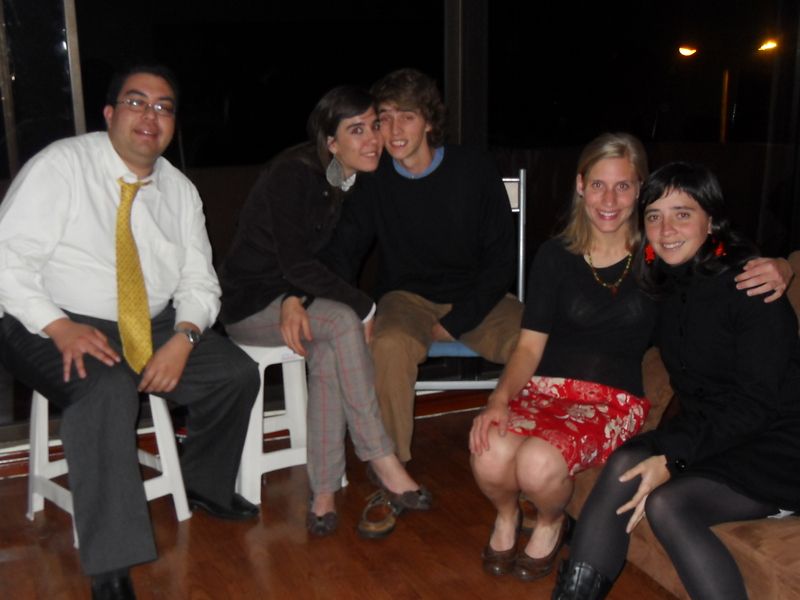 I stayed with my mother’s cousin Vicky, daughter of my Abuelito’s sister Maria Rosa. I met lots of cousins, aunts and uncles, but spent the majority of my time with Vicky, her husband Fernando and their three children. Andrea is 26, Vicky Sue is 20 and Fernandito is 14. They live in a gated community in a beautiful area a few miles outside of the city. 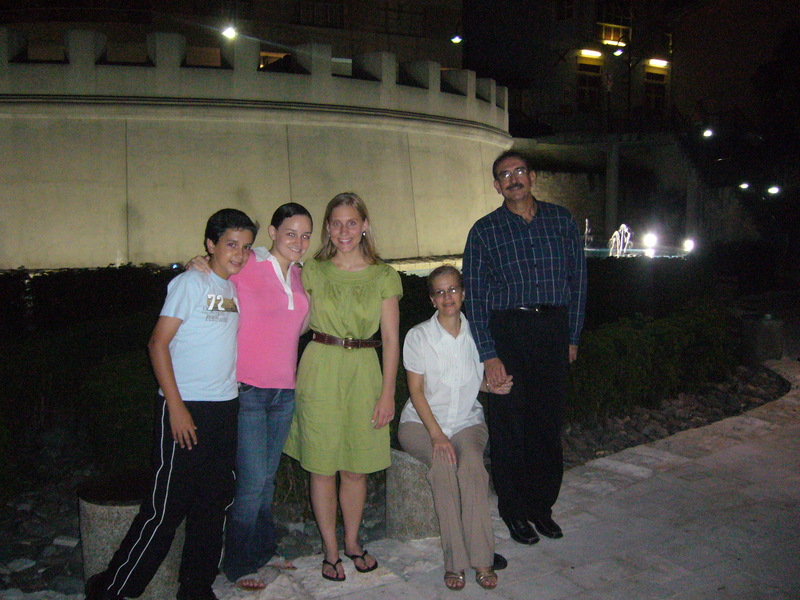 During my stay with them they showed me around Guayaquil; we went to the Cathedral, Parque de las Iguanas, El Malecon (a boardwalk lined with simple attractions like old train cars, ice cream stands, fountains, mini-monuments etc.) and El Parque Historico. 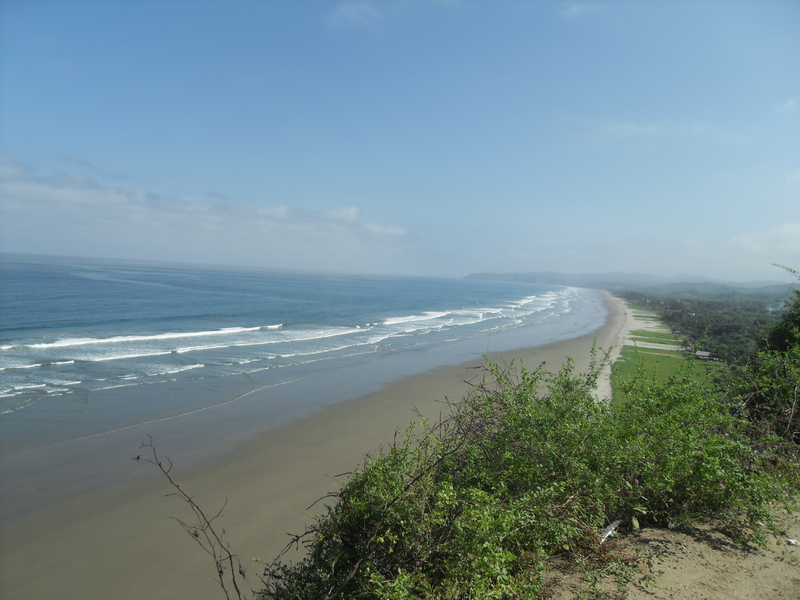 Over the weekend they took me to a couple of beaches I wanted to visit- Salinas, Punta Blanca and Montanita. The sun there is extremely strong- but I used 50 SPF and didn’t burn! I spent time with my Great Aunt Maria Rosa, who spends a lot of time putting puzzles together and is adorable. I also went to classes with my cousin Vicky Sue who is studying jewelry design and is incredibly creative and talented. I went to church with Vicky, who is very active at Santa Teresita, the family parish just a few blocks away. Fernandito and I did some cooking together; we made lemon bars and chocolate chip cookies! In general I was able to relax a lot and enjoy getting to know the family and improving my Spanish through long conversations. All in all it has been a lovely stay. I will try to do a last post in the next couple of days to close out the blog. Thank you all for reading! Since over 90% of Ecuador is Catholic, Semana Santa or Holy Week has many festivities and customs observed by virtually the whole country. As with any holiday here in Ecuador, there is a special food associated with Easter. It is called Fanesca, and it is a very hearty soup made with as many beans and grains as can be found, salt cod, milk, onions, peanuts and lots of other delicious ingredients, topped with slices of hard boiled egg, plantains, red pepper and parsley. It is only made once a year during holy week and I have already eaten three different, equally delicious, versions. Another tradition that I participated in this year was the siete visitas, in which I made pilgrimages to seven churches in the historic district to offer up prayers and petitions. I was able to go with my friend Margarita, whose family is part of Opus Dei. According to its website, “Opus Dei is a Catholic institution founded by Saint Josemaría Escrivá. Its mission is to help people turn their work and daily activities into occasions for growing closer to God, for serving others, and for improving society.” Good Friday, I went back to the Centro Histórico with my friend Jessie and her host family to watch the famous Procesión de Jesús del Gran Poder. 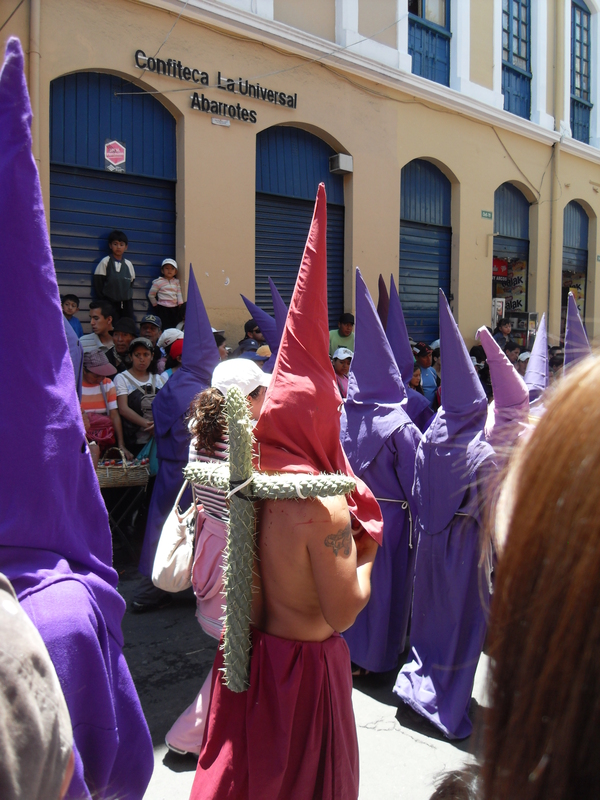 In this procession, people who want to do penance for extraordinary sins or evils they have committed don purple robes with pointy headpieces and march in the procession. The special name for them is “cucuruchos.” The procession also includes many people dressed as Jesus carrying massive and very heavy crosses, often walking barefoot and sometimes with crowns of thorns. Others walk the route wrapped in barbed wire or dragging heavy chains on their ankles. It was a very moving and difficult reminder of the physical agony that came before the Resurrection that Christian’s celebrate on Easter. Jessie and her family and I watched in a packed crowd, underneath umbrellas to shield us from the heat. Nonetheless, a woman next to us fainted and we dutifully shouted for CRUZ ROJA (Red Cross)! I also narrowly avoided being pickpocketed by the old man innocently standing next to me, groping into my purse. Holy Saturday I was able to go to the beautiful chapel in the women’s house of Opus Dei once again with Margarita for the Easter Vigil. As is the Catholic custom in many parts of the world, the ceremony began with all the lights out. The priest then lit a candle and shared the flame with someone; each of us held a small candle. As the flame spread to each person at the service, we began singing, and the priest reminded us that Christ is the light of life. After Mass Margarita and I went out for dessert at TGI Fridays. We then headed over to the men’s Opus Dei house where they have an annual skit night on Holy Saturday. In one of the performances, four elected audience members repeated a short interchange having to do with selling/buying a “duck” in different accents mandated by the Master of Ceremonies. First they each had to perform the interaction like someone from “the coast,” for example. Then as a Chilean. Then as someone “posh.” Then as Professor so-and-so that everyone knew very well..etc. All very amusing. The party continued at one of our friend’s apartments with more refreshments, music and conversation. Easter Sunday I cooked some typical American dishes for my host family. I made a green bean casserole (french fried the onions myself), bacon, scalloped potatoes, deviled eggs and scones with lemon glaze. I also skyped with my parents and siblings back home for quite a while. From Saturday, March 13- Saturday March 20, I threw in my lot with a group of students from Franciscan University of Steubenville, Ohio to go on a medical mission to bring a health clinic and spiritual nourishment to pueblos in the Amazon region of Ecuador. The team also included American doctors and nurses, Ecuadorian priests and a number of English/Spanish translators. My role was to help translate health talks and religious talks and skits for people waiting to be seen at the clinic.The week was filled with rich experiences of generosity, culture, nature and community. My only connection with the group was that I had been in email contact with a Franciscan alum, Lily Hannon, who is currently living and working in an orphanage on the coast of Ecuador. She and her missionary partner Breanna, had planned to participate in the mission trip, and it so happened that the dates exactly aligned with my Spring break. For those of you who just want to see it, here is a slideshow of the trip! After a wonderful Spring break, which I will post about next, I began my internship Monday. My commute to work, located in a Sector of Quito called La Floresta, is about a half-hour bus ride then a ten minute walk. Grupo Social Fondo Ecuatoriano Popularum Progressio is the name of the larger non-profit I work for, but within GSFEPP there are many businesses and outreaches. Several headquarters are located in the Quito office and “La Escuela” (EFE) is on the top (fourth) floor. I share an office with two others and have my own desk, drawers and a computer. I work Monday-Thursday, 8 a.m.- 5 p.m. and the internship will last six weeks, until the end of April. The project I am working on now is updating the pages on the EFE website- quite a task. I began by cataloging areas for improvement and noting what information is lacking or out of date. Today I drafted a piece for the “current news” page that highlights the course that EFE created for the students at my University here, Fundación CIMAS. I also began creating promotional content for another section of EFE that supports Estructuras Financieras Locales (EFLs). Another project I will be working on is the organization and utilization of a vast photo archive. In addition to my personal work, I am being completely integrated into company activities and dynamics. My compañeros consult my opinion about designs on promotional material or photo choices. Today we had a meeting to discuss a new logo; when to use it, how to use it, what it symbolizes etc. One of my coworkers is trying very hard to teach me Kichwa phrases. I take my lunch break with my coworkers and they often bring snacks or treats to share during our morning break. We are all going on a day trip on Sunday to barbecue at someone’s Rio Bamba house. Much of my personal work involves seeking information from other responsible or more-informed coworkers. They are always patient and very willing to help me find what I need. I’m really enjoying the work so far and I look forward to learning more each day. Today I went to Mindo, another cloud-forest tourist town. Three friends and I rode a bus for about two hours getting into town in time for lunch. We decided quickly to do zip-lining and soon were riding in a truck up to the first of ten cables. Our guides were two Mindo natives who had as much of a blast as we did (understandable when your job is zip-lining…) and obligingly told us about many of the plants we passed and their properties. Over the course of ten cables that sent us zooming over the forest, we took turns trying the different zip-lining positions: murcielago (a bat-like position), mariposa (a butterfly-like position) and Supermon (a Superman like position). Unfortunately we only brought one camera, so I don’t have the pictures to display, but it was very extreme and very fun. After riding in the back of the truck into town, we ate bananas covered in chocolate sauce made from cocoa beans ground that day. Then, we paid $2 to tour through a beautiful greenhouse/garden full of mariposas and flowers! I went kind of crazy with the camera… And below are the results! VIEW AWESOME SLIDESHOW ON PICASA BY CLICKING HERE! 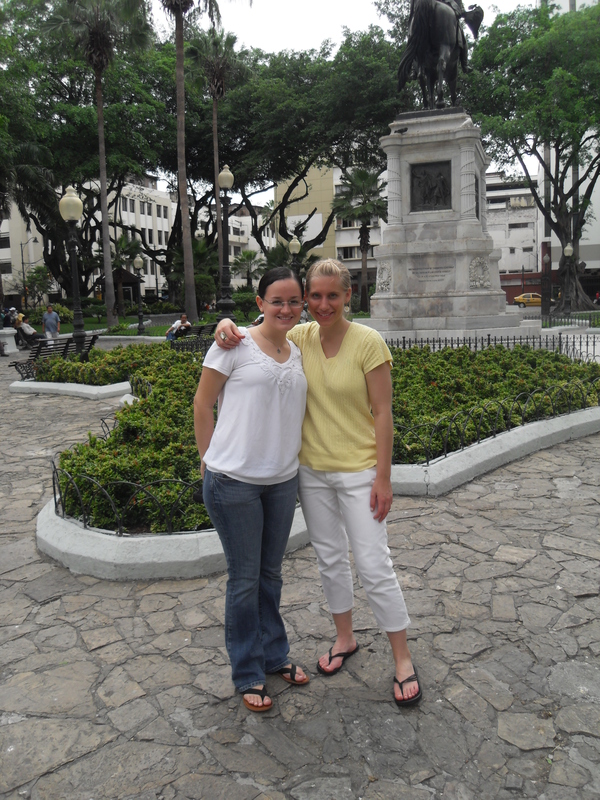 Ecuador in my eyes · A glimpse into one student's study abroad journey.